Msgr. Robert Hugh Benson (18 November 1871 – 19 October 1914) was the youngest son of Edward White Benson, Archbishop of Canterbury, and younger brother of Edward Frederic Benson. Benson was educated at Eton College, and then studied Classics and Theology at Trinity College, Cambridge, from 1890 to 1893. In 1895, he was ordained a priest in the Church of England by his father, Edward White Benson, who was then Archbishop of Canterbury and therefore head of the Anglican Church. As such, his son's conversion to Roman Catholicism in 1903, and his subsequent ordination, caused a sensation. His father died suddenly in 1896, and Benson was sent on a trip to the Middle East to recover his own health. While there, he began to question the status of the Church of England and to consider the claims of the Roman Catholic Church. His own piety began to tend toward the High Church variety, and he started exploring religious life in various Anglican communities, eventually obtaining permission to join the Community of the Resurrection. Benson made his profession as a member of the community in 1901, at which time he had no thoughts of leaving the Church of England. But as he continued his studies and began writing, he became more and more uneasy with his own doctrinal position, and on 11 September 1903 he was received into the Roman Catholic Church. Not since Newman's conversion almost 60 years earlier had the reception of a convert into the Church caused such a commotion. Shudders of shock shook the Anglican establishment. He was ordained a Catholic priest in 1904 and sent to Cambridge. He continued his writing career along with the usual elements of priestly ministry. He was named a monsignor in 1911. Before his untimely death in 1914 at the age of 43, he would write 15 highly successful novels as well as many other books on the Catholic faith. He was a friend of Chesterton and they were in mutual admiration of eah other’s literary works. Both Chesterton and Ronald Knox admitted the influence of Benson on their own conversions. 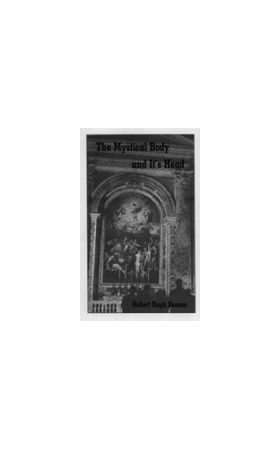 Robert Hugh Benson: Life and Works , a biography by Janet Grayson was published in 1998. This 68 page book is an abridgement of his famous work titled Christ and His Church. Two of his best known novels are Come Rack, Come Rope and Lord of the World. We have already considered generally the “failure” of Christ and of His Church; and Judas Iscariot is therefore logically, as well as historically, the first personage of the Passion to be considered. For, while his motives in detail, in their complexity and interaction, are unknown to us, one thing is certain—viz., that not only was he the one failure amongst the friends of Christ, but that the main reason for his apostasy, as for all true apostasies, was that Christ had failed to satisfy him. He had once believed, he had once been ardent and wholehearted; children had blessed him as he came preaching the Kingdom of God with power, devils had been subject to him; and now, for some reason or another he had changed his ideals. That was all. The Catholic Church has, I think, this characteristic in an almost unique degree, that while on one side she is capable of arousing the most passionate devotion that can ever be given to a society, she also arouses, in those who leave her, the most violent opposition. An indifferent apostate is a very rare phenomenon. When persons leave other denominations they do not immediately turn around and assail them. I have known innumerable converts from very many forms of Christianity, as well as from agnosticism and positive infidelity; but it is exceedingly seldom that I have ever heard anything but expressions of affection or respect for the systems, or at any rate the persons, whom they have left. The utmost I have heard is a certain impatient irritability or contempt towards the system, for having so long detained them on the road to Jerusalem, for having persuaded them that they were already members of a divine society, whereas now they see it to be but human after all. But if one wishes to hear reviling carried to a fine art, to hear an entire range of abusive vocabulary poured out, the meanest motives attributed, the worst interpretations put upon innocent actions, and all with the ardor of an ecstatic, one must turn to the apostate monk or the “escaped nun.” The very intensity with which the Church is assailed by those who were once her friends, and the lengths to which they will go—this is as much a mark of what she is as is all the sanctity of her saints. Ex-Anglicans are often bored by the subject of Anglicanism, but they never treat it with fury or cynicism. Ex-Catholics, however, can seldom leave Catholicism alone. Judas does not become a critic, he does not even become a Pharisee; he becomes a supereminent traitor, just because of the supereminence of the person he once adored. Of course these ex-lovers of the Church found their accusations again and again upon what is objectively true. They know well her weakest lines of defense, and her very human humanity; they have a private key to the door of the garden where she may always be found. It is quite true that Christ did say something very like—”I will destroy this Temple, and in three days raise it up.” It only required the transposition of a word or two to turn His phrase into the threat of a dangerous fanatic. And Judas could, no doubt, have supplied incident after incident witnessed by himself, countless words dropped in conversations by the wayside, to justify him in his betrayal of his Master. 1. Now, it is characteristic of divine truth alone to be treated in such a manner, always and consistently. Human opinions are as incapable of calling out this white hot antagonism, as they are incapable of drawing out the highest devotion. The really monumental crimes of human history are always concerned with really great principles; and the very preeminence of Judas’ treachery is a sort of witness to the unique cause which it concerned. The whole world consents that the crime of Judas is the crime par excellence of human experience. Is not this very consent a witness to the unique character of the cause and the person that were betrayed? Other traitors have betrayed other friends, but their names have not passed into proverbs in consequence. 3. It must be noticed that the sin of Judas is, from its very nature, a sin that can only, in its full horror, be consummated by Christ’s intimates. It is the habit of Christians to treat it as a practical impossibility for themselves. “Is thy servant a dog that he should do this thing?” But it is a sin that the “dog”—the mere attached dependent—cannot commit. It is reserved, in its full luxuriance and malice, for the closest and warmest lovers of Jesus Christ—for those who have a kind of right to kiss Him and call Him friend. The scandals of Catholic life, therefore, are just one more mark of identity between Christ and His Church. This or that Pope, bishop, nun, priest, or layman, whose names are quoted as bywords for sin, who are supposed to stand for unanswerable arguments against the Church’s claim, are, so far as they are preeminent among sinners, also preeminent as Catholic credentials. A bad Catholic, it is universally acknowledged, is the foulest thing on God’s earth; a corrupt pagan cannot be one tenth as corrupt, simply because the same character that is capable of being raised to friendship with Christ, is capable also of the extremest enmity. 4. Neither is this sin of Judas so rare as is sometimes thought. In its full malice no doubt it is rare, but in some degree it forms an element in every sin against light. (a) First come the Apostates proper, those who have deliberately (or even unconsciously as regards the full significance of each separate step of the process) changed their ideals, and have declared that change to the world those who once hung upon the Church’s lips, gave her love and loyalty, spoke in her name, and worshiped at her side, and who have gone out from the table of the Lord when the eternal night had fallen on their souls. “Nox erat qui abiit,” says Saint Augustine. “He was night who went out.” And it is those, primarily and preeminently, who turn Christ’s triumph into failure. Remove, in imagination, all apostates from history, and nine-tenths of Christ’s mystical Passion would be gone. “Et tu, Brute!” screamed Caesar. “Friend, wherefore art thou come?” whispered Jesus Christ. (c) And, finally, come those of every class of sinners, in whom the tragedy of betrayal is wrought in silence—those amongst whom stands every sinner, however small a degree. For each soul is as great as the world, and in each soul there is room for all the tragedies of the world to be reënacted, as every puddle is great enough to hold the sun. For to each soul Christ comes, all trusting as a friend, and in each soul He is betrayed over and over again, into the cowardly hands of Pilate, and the grasping hands of Caiphas, or to Herod’s noisy self love. There He comes as to a garden to meet His friend; and He is met indeed by that friend, and kissed . . . . As every soldier carries in his knapsack a marshal’s baton; so every Christian carries on his lips the possibility of a Judas kiss. 5. It is argued sometimes that the motive was too little to account for Judas’ sin; at least his Master was worth more to him than thirty shillings! Yet the same thing is done over and over again at a smaller price than that. Over and over again men will be found to sell their conscience which is to betray their Lord—a moment’s sensual pleasure; or women for their social reputation or a little empty self love. It is a matter of the changing of ideals. If a soul lives long enough on the plane of sensuality or of ambition, she finds that Christ is worth less than nothing there. And, above all when once such a choice has been made, how difficult is repentance! Remorse is easy enough, but repentance means love and a soul that has lost her lover has lost her own power of loving. How helpless, then, seems the cause of Christ! One degraded priest, one passionate or selfish child has Him at his mercy, and betrays Him over and over again. History is full of such sins, and, as each sin is consummated, the cause seems lost. Again and again Christ has been so betrayed, and again and again the world has uttered its comment, “He cannot keep His friends; He cannot save Himself. Surely He cannot be the Son of God!” Every apostate that has ever lived has been one more incarnate argument against Him; every scandalous Catholic life has furnished a thousand disproofs of His Divinity, and yet Christ lives and is adored; yet His Church with all the sins of her members is accepted as divine. In fact, these betrayals are worked up into the fabric of God’s redemptive Plan. “For the Son of Man must be betrayed into the hands of sinners . …and after three days He shall rise again.” Can any Church be less than divine which has produced, and has survived, so many Judases?